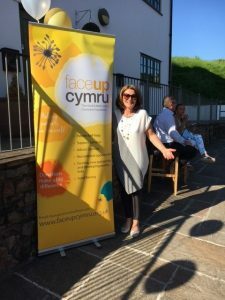 I am delighted to report that the ‘Lazy Summer Sunday BBQ’ in aid of Faceup Cymru on Bank Holiday Sunday 27th August 2017 was a huge success raising £3,355 on the night. They found and secured the wide variety of artists who all supported our charity with significantly reduced and in some cases, no cost to our expenditure. 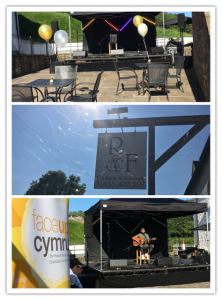 We had two bands, one Spanish acoustic artist and a singer, all taking turns to perform throughout the afternoon and evening late into the warm summer night. 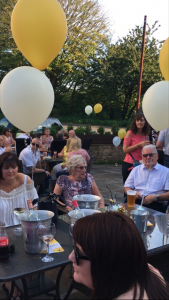 The evening was magical, as the stage and tables were set amongst the old stone building and flag stone floors and as the sun went down, the building retained the heat and gave the atmosphere of a typical Spanish night. Once the dancing had finished, those that were left were able to sit out until late. 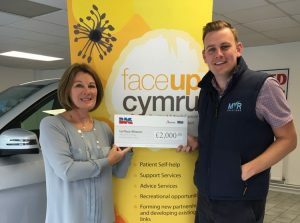 In addition, Jon and Steve Moore of MVR Solutions, Newport, won a golf competition and nominated Faceup Cymru as the small charity they wanted to support. So, I am delighted to report the Summer Fundraising Campaign has raised a grand total of……….